Cheek implants are the one assured permanent method of midfacial structural enhancement. They have been available for clinical use for almost forty (40) years and numerous styles and sizes are available which has evolved over the years. While the biggest fear with cheek implants like any facial implant is infection, this is not the most common complication. Nor is their size or shape of the implants although these can also be a potential postoperative problem. The primary aesthetic problem with cheek implants is….asymmetry in my experience and observation of managing many cheek implant revision patients. And this would be expected with any implant surgery in which there are two sides. 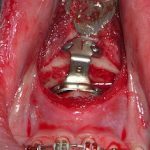 This risk is much higher than chin implants, for example, because that is only one midline implant that needs to be placed. 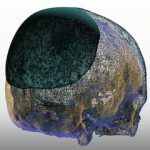 Patients understandably overlook the fact that cheek implant surgery is really two separate and independent operations. It may be done on one patient and in one surgery but there are two separate surgical sites that do not connect and must be performed through two separate incisions. When you combine that with some potential natural cheek bone asymmetry that many patients have, it is easy to see how cheek implant asymmetry is not only possible but common. The most common type of cheek implant asymmetry I see is due to what I call ‘handiness’. What this means is that the right or left handedness of the surgeon can have an influence on the cheek implant malposition. This is due to the fact that for many facial implant surgeries the surgeon tends to remains on one side of the face when operating…and it would be their dominant hand side. For many surgeons who are right-handed this would mean they stand on the right side of the patient’s face and perform both cheek implants with incisions in the mouth from this perspective. This handedness provides two slightly different views of the right and left cheek bones and implant positions from inside the mouth. 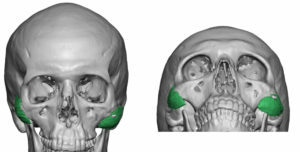 As a result, as seen in this 3D CT scan of a patient with cheek implant asymmetry, the right cheek implant is angled more vertically while the left cheek implant is more ideally positioned. This is the result of seeing each separate cheek implant pocket and positioning differently. It doesn’t take much, a 10 to 20 degree angulation difference between the two sides, to have an exterior cheek appearance that is different. While not every cheek implant asymmetry is a right cheek implant malposition, it merely reflects another variable in bilateral cheek implant surgery that often goes unrecognized.